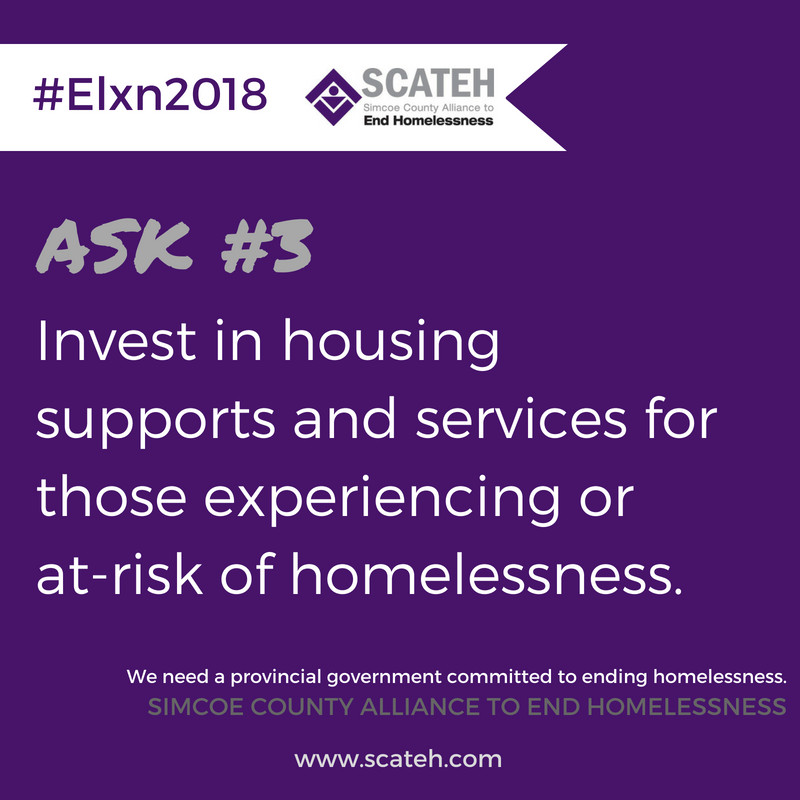 SCATEH has partnered with the other Alliances to End Homelessness in Ontario to develop key messages specific to ending chronic homelessness. See below for these messages and some actions you can take during this election. Commit to meeting the provincial target of ending chronic homelessness by 2025. Designate a certain percentage of all National Housing Strategy resources to programs, housing, and strategies that create permanent successful housing outcomes for people experiencing homelessness. Increase funding for supportive housing, including Housing First programs that give consumers choice, consider gender equality, and ensure those experiencing homelessness are supported by culturally relevant services appropriate to their need, including Assertive Community Treatment and Intensive Case Management. Ontario Non-Profit Housing Association | Co-operative Housing Federation of Canada (2018). 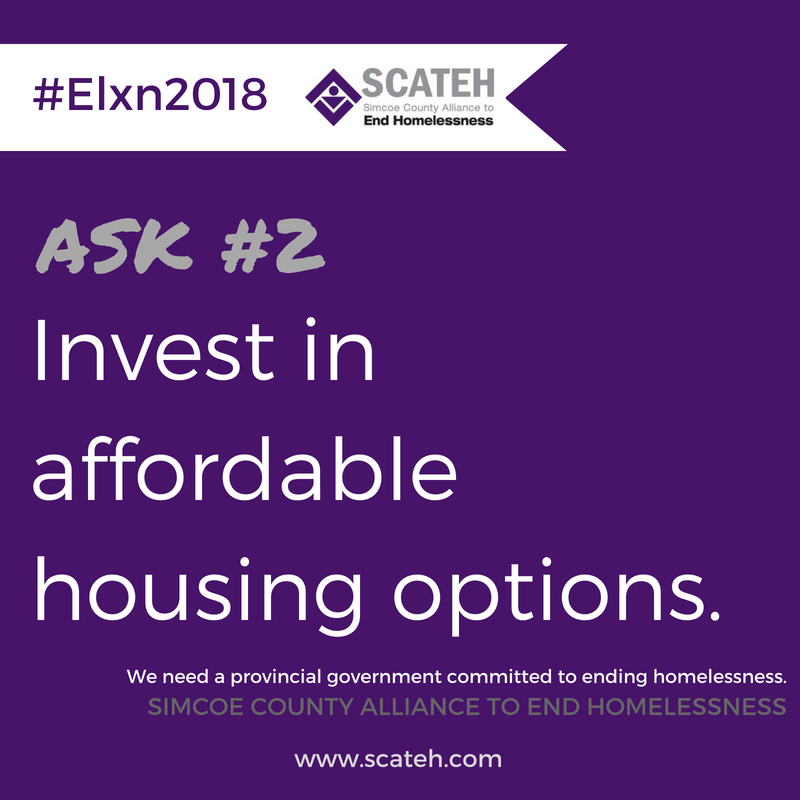 An Affordable Housing Plan for Ontario. Wellesley Institute (2017). A Supportive Housing Strategy for Mental Health and Addictions in Ontario. Evidence Exchange Network’s Ontario Housing First Regional Network Community of Interest (2017). A Portable Housing Benefit as an Indispensable Component of Ending Homelessness in Canada. Canadian Alliance to End Homelessness (2018). 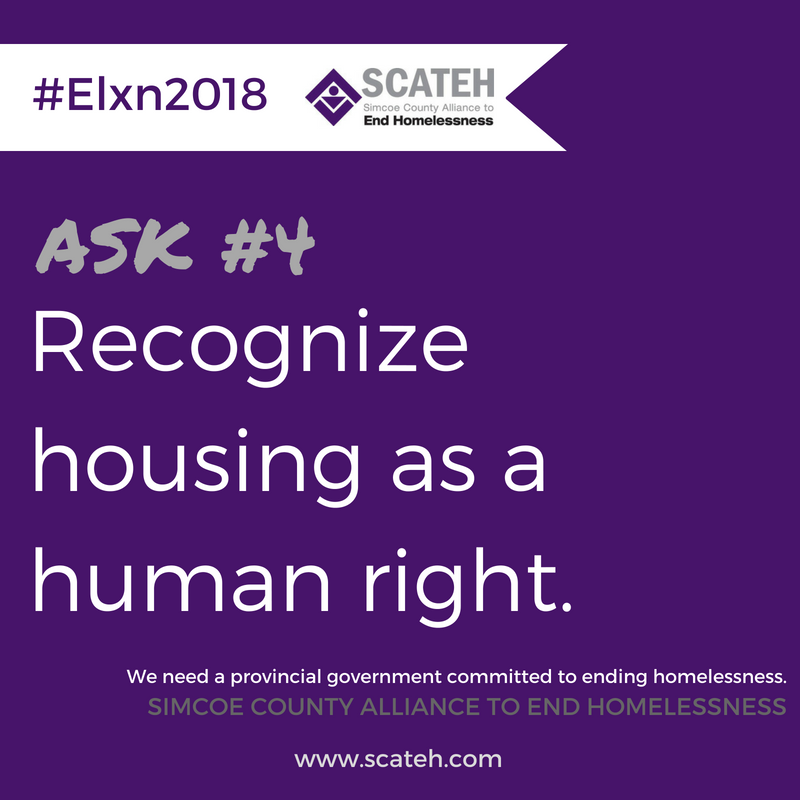 Discussion Paper: Ending Homelessness and the Right to Housing. 1. Engage candidates on social media. You can share these images on social media. Use the hashtags #Elxn2018 and/or #ontpoli, and you can tag your local candidates as well. 2. Attend an all candidates debate. Choose one of these asks, and turn it into a question. Write it down, and choose a seaat near a microphone at the debate so you can be sure to have a chance to ask your question. Leave us a comment to get signed up for the Coordinated Candidates Call Day on June 4th! 4. Vote, and take a friend. Make sure you get out to vote on or before June 7th, and find a first time-voter or a voter with transportation challenges to take with you! Click here to find out what riding you are in, and who your candidates are.